Description: Pre-menstrual Syndrome (PMS); where it has been shown to eradicate swollen abdomen and help reduce breast discomfort, as well as reducing irritability and depression. Eczema and o.. Description: HealthAid Omega 3 750mg Capsules are specially formulated using Norwegian salmon fish oil to give a highly concentrated source of Omega-3 Polyunsaturates, EPA and DHA in their free fr.. Description: While our body has the ability to produce omega 9, critical for heart health, omega-3 and omega-6 are two types of fats considered “essential” as they cannot be manufactured by the bo.. Description: Pre-menstrual Syndrome (PMS); where it has been shown to eradicate swollen abdomen and help reduce breast discomfort, as well as reducing irritability and depression. Eczema and other s.. Description Nature's Bounty Fish Oil contains EPA and DHA which help support and maintain the health of your cardiovascular and circulatory system. 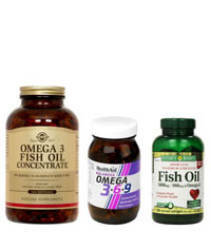 ** Omega-3 fatty acids are considered “g.. Description : Helps maintain healthy triglyceride levels already in the normal range. Helps support heart and brain health. Odor-less, Coated to Minimize Fish Burps Odor-Less, Coated.. Promotes Heart Health Purified to Eliminate Mercury, PCBs & Dioxins Omega-3 fatty acids are considered one of the 'good' fats important for cellular, heart and metabolic health. But getting a..
Providing 90mg GLA (9%) Promotes Women' Health Rapid Release Liquid Softgel Natural Support for Women with PMS Herbal Supplement Guaranteed Quality - Laboratory Tested Evening Primrose is .. Description : Helps maintain healthy triglyceride levels already in the normal range. Helps support heart and brain health. Odor-less, Coated to Minimize Fish Burps How to use : ..
Additional Information High strength fish, flax and borage oil combination. An ideal all in one omega oil blend in a capsule. Ingredients Three (3) softgels provide: Fish Oil (from anchovy and sard..
Evening Primrose Oil is one of the richest sources of the unsaturated fatty acid Gamma Linolenic Acid (GLA), which is important for women' nutrition. This formulation provides premium quality primro.. This formulation provides a natural, concentrated source of the essential Omega 3 fatty acids EPA and DHA from deep-sea, cold-water fish. EPA and DHA support cardiovascular, joint and metabolic he..
Solgar' Full Spectrum Omega Wild Alaskan Salmon Oil Softgels are carefully manufactured from Wild Alaskan Salmon that were sustainably caught from the pristine, cold waters of Alaska. These soft.. Description Since 1947 Double Strength EPA & DHA Heart Healthy Purified to Eliminate Mercury & Other Contaminants Gluten, Wheat & Dairy Free Dietary Supplement Omega 3 700 pr..